The Sanja Matsuri or Sanja Festival is the biggest of Tokyo's three great festivals, along with the Kanda Festival and Sanno Festival, which alternate every year. During the annual festival thousands of frenzied devotees gather for traditional portable shrine processions, ancient ritual music and dancing, and other festivities. The processions are in honour of the three resident deities of the Asakusa Shrine, who are paraded through the streets in huge, elaborately decorated mikoshi or portable shrines carried on the shoulders of dozens of strong men dressed in traditional festival clothing and surrounded by chanting worshippers. Up to 100 other mikoshi are carried around in processions meant to bring blessings and good luck to the area and its inhabitants. 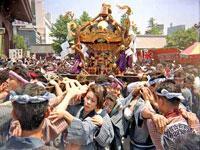 About two million people visit Asakusa to pay tribute and celebrate over the three days of the festival. The district is packed with food stalls, festival games, music, and dancing. The festivities begin with the Friday afternoon Daigyoretsu Parade, a large procession of priests, officials, geisha, musicians, and dancers wearing traditional Edo period costumes.